Making cloth from tree bark. Sarawak and Borneo are names that have conjured up images of ferocious headhunters who live in long houses in thick and impenetrable jungle. This may have been true a hundred years ago, but not so anymore today. Yes, Sarawak is still sold as “the land of the headhunter and longhouses” which is a big draw for tourist from all over the world. They come to see the unique tradition of a whole village housed under 1 roof, relics of the old head hunting days and also their vibrant culture. Traveling to these longhouses can be a timely and costly affair as they are often located many kilometers away and involve traveling by road and long boats along remote rivers and with a minimum of a nights stay. While this is truly an interesting experience, not many of today have the luxury of time or often the finances to do such a tour. 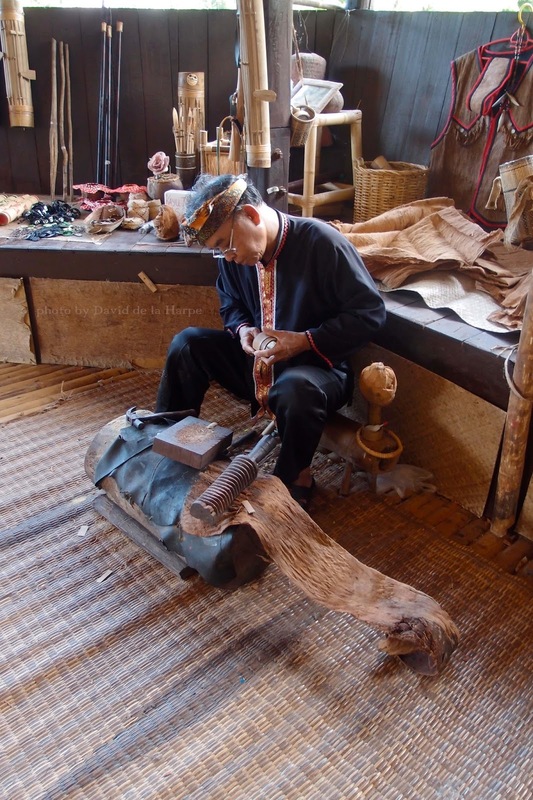 So if you’re short of time but still want to get a near authentic cultural experience without all the traveling, you can always visit the award winning Sarawak Cutural village. the various tribes such as the processing of sago, making local cakes and traditional handicraft. The nice part is that visitors get to sample these foods and also purchase them right from the maker. As you enter each different house, you can have your “passport” stamped and be entertained with traditional dances or traditional music. For some physical interaction, try your aim with the blowpipe at the Penan hut or get an instant “Marker pen “ traditional tattoo. The residents of each house are only too pleased to share their information of each traditional house, so don’t be shy to ask. At the end of the tour, head to the theatre to enjoy the cool air-conditioned interior and also the cultural dance performances from the various ethnic groups in Sarawak. If hunger pangs overtake you, then head over to the restaurant for some local dishes. The entrance fees to Sarawak Cultural Village are RM60 for adults and RM30 for children (6 to 12 yrs). Tickets can be purchased at the entrance of the Cultural Village and it is open daily from 9am till 5.15pm. There are 2 cultural shows, which are at 11.30am and 4pm and they last 45 minutes. From my experience, you’ll need roughly 2 hours to cover this place comfortably.